The Fathom Paris for Dessert Sweepstakes is only open to legal residents of the 50 United States and District of Columbia who are at least eighteen (18) years old. The Fathom Paris for Dessert Sweepstakes ends at 11:59 PM (EST) on June 18. 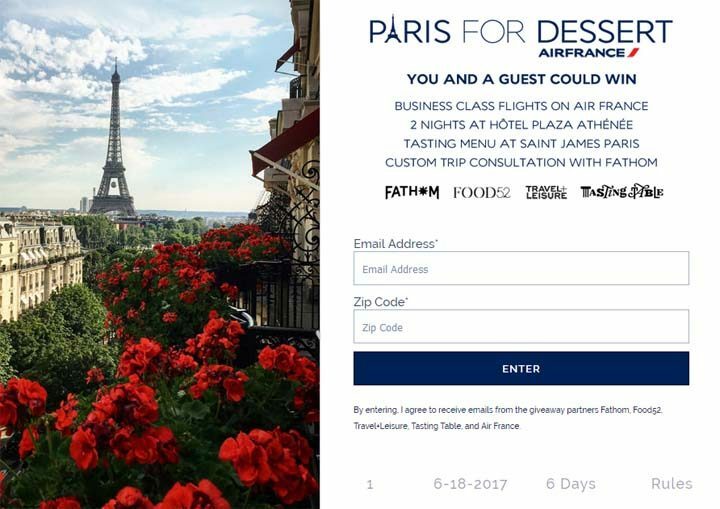 Participants must enter by submitting their name, a valid email address and US zip code via the form provided at fathomaway.com/paris-for-dessert-giveaway-2017. The Winner will receive two (2) Air France round-trip Business Class tickets from an Air France USA gateway (ATL, BOS, DTW, IAD, IAH, JFK, MIA, LAX, ORD, SFO, MSP) to Paris (CDG), France; two (2) nights of accommodations in a deluxe double room at Hôtel Plaza Athénée; dinner for two (2) at Le Restaurant at the Saint James Paris chateau-hotel; and a trip-planning consultation with Fathom. The value of the Prize is Twenty Two Thousand Dollars and Zero Cents ($22,000.00).